Things have been crazy. We moved and now we're having to move again just 30 days later. We never unpacked a single box the entire time we lived here. The area I thought I would be using as my altar spot has had a perpetual leak, making it impossible to set up. Our house is the result of the unfortunate reality when the wrong owners get a hold of beautiful historic homes. I digress. Because of the interior struggles of the house, I opted for a natural outdoor altar this past sabbat. While I typically offer a diagram explaining my altars, natural altars tend to be fairly self-explanatory. They tend to be things you find in nature, especially that which you find around the area in which you are displaying the altar. For example, I collected leaves from the deck and paired them with beautiful fall-blooming flowers from the yard. Admittedly, the pumpkin and apples are not from my garden. I never had the chance to plant one, much less see it come to fruition this year with the moves. Instead, I got them from my local farmer's market. The apples have been positively delicious; super sweet and juicy. I haven't had a chance to crack the pumpkin open. I hope it doesn't go to waste in the monotony of everything but, if nothing else, I will save the seeds for our next garden (and some for my circlemates as well!). One of the few items I brought out was my Kitchen Witch straw doll. I've had this little gal for a really long time. In fact, she actually came with a heart-shaped tag that said she was specifically a Kitchen Witch, but I lost the tag in the wind on this altar. Sad day! But she's one of my favorite dolls, and especially appropriate for a holiday that celebrates cooking and creating from your harvest. Here she is still with her tag. I can even see in this picture that it's disconnected. I watched it fly off and into leaves, never to be found again. That being said, this little gal was hanging out admiring my work. I had to disconnect a single thread of her web to put the altar together, but I left everything in tact so she could stay. Spiders tend to represent the spirit or the soul, as well as the intricate web of life we weave. It was interesting that she had spun her web right in front of my altar with just enough room for me to work sans cutting one line. She was scared but remained in the middle of her web the entire time I was out there. 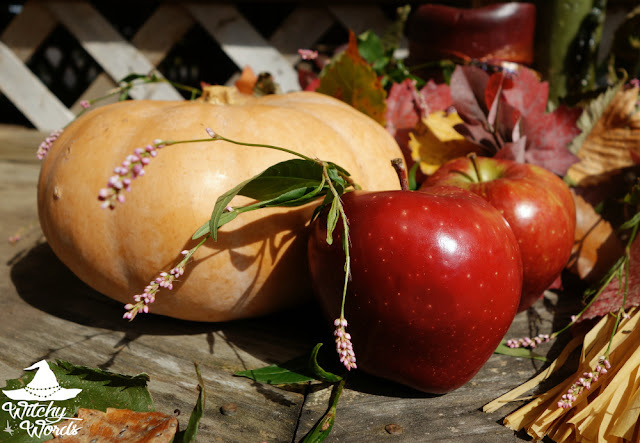 Overall, doing a natural altar for Mabon was a fun, laid back experience in the hectic chaos that is currently our life. I definitely appreciated it! Beautiful! I let my daughter do our altar this year. She picked out some gourds and "artistically" placed them on a piece of furniture. That was all she wanted. At the time. I think our Samhain altar will be a bit more crowded, but at 7, she is just getting old enough to be allowed free reign with such things. I have a separate altar for my workings that I usually decorate, but she was insistent that she be allowed to do her own this year, so while I did a few things to my working altar, I let her decide what the family altar would look like. I was so proud. Hi Marietta! New reader here. When I found out you were from the KC area, I was thrilled! I hope to someday become involved with the community as I learn more about Wicca. Which farmer's market do you go to? 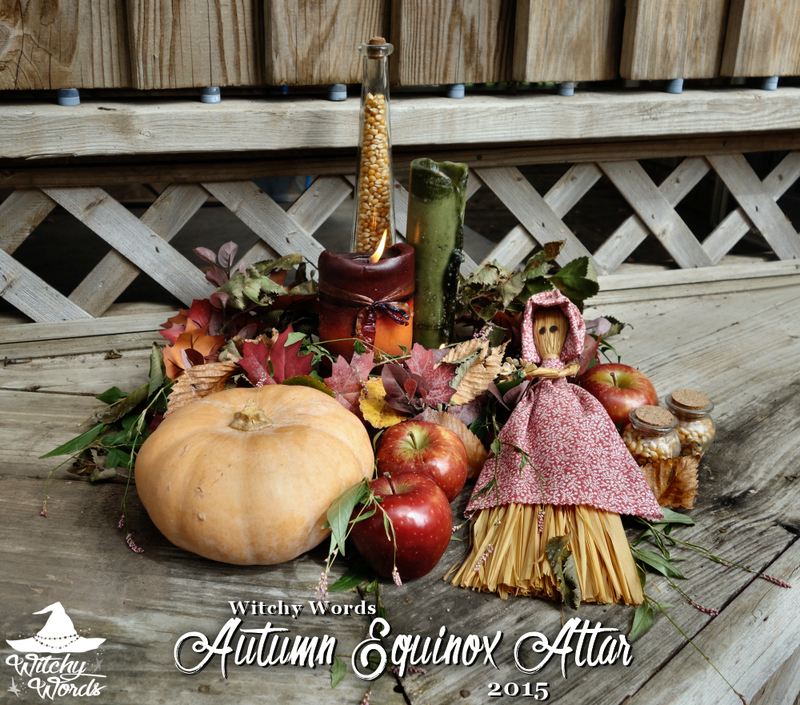 I made my very first altar on Mabon out of gourds and apples from the Overland Park farmer's market. Some of the best apples I've had in a while! Hi Marietta . Your alter looks great. I have been following your blogs now for over a year. It's a shame, that we live so far apart. I have been reading and researching on the websites. I could do with a little bit of one to one if that is possible. So that I may join in over the internet. I am on he look out for like minded people. But, they are to far away. I will keep looking. Do you have any suggestions on how to find somebody? ?